This is a fantastic way to cook pork and it will be a big hit with all your family and friends. Using a sharp knife split (butterfly) the pork steak to open it out. Mix together the garlic, coriander, lime juice and chilli powder. Add in the yogurt and spread this all over the pork steak, ensuring it is fully coated. Cover with some cling film and allow to marinade (in the fridge) for at least an hour to allow the flavours to mature and develop. Heat the barbecue and then cook the pork steak on both sides for 7-10 minutes ensuring it is fully cooked. Depending on your barbecue, during the cooking process you can move it to a cooler part of the barbecue. Ensure the pork is fully cooked before serving. Cook the pasta, according to the packet instructions in boiling salted water. When the pasta is cooked strain off the water and refresh it under cold running water until it has completely cooled down. Meanwhile heat a medium sized pan with a little oil and add in the garlic, chilli, onion, ginger and mushrooms and cook gently for 4-5 minutes until they have softened. Remove from the heat and allow to cool down. 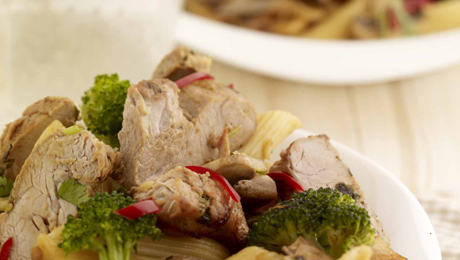 Mix together the pasta and the vegetable mixture, pour in the soy sauce, mix well and serve immediately with the barbecue pork.